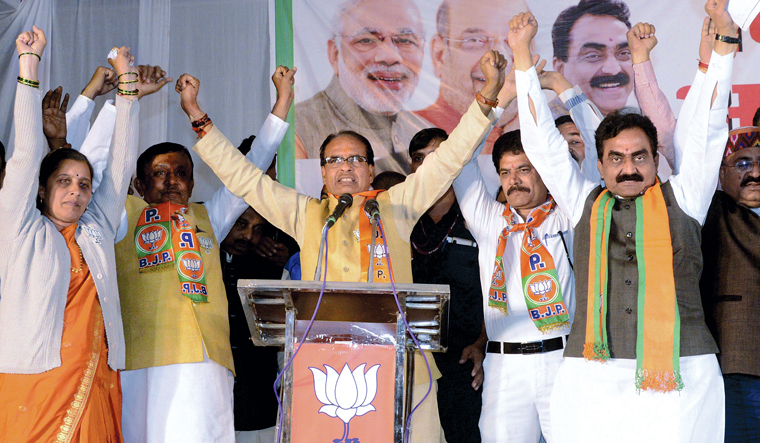 For the BJP’s campaign juggernaut, Madhya Pradesh is a major stop on the road to the Lok Sabha elections next year. The state has 29 Lok Sabha seats, which is equal to the number of seats in Telangana, Chhattisgarh and Mizoram put together, and four more than in Rajasthan. The BJP has always projected Madhya Pradesh, along with Gujarat, as a ‘model state’ in terms of both development and the party’s grassroots reach. And, much like it had been in Gujarat last year, the party is battling a resurgent Congress after having been in power for more than 15 years. Along with Chief Minister Shivraj Singh Chouhan, two Gujaratis led the BJP’s fight—Prime Minister Narendra Modi, who was the party’s general secretary in charge of Madhya Pradesh in 1998, and BJP president Amit Shah. Before 2003, Madhya Pradesh had been a Congress bastion, even though the party often won elections by 1 to 2 per cent margins. Under Chouhan, the BJP brought about a paradigm shift by garnering support of the backward communities, which constitute nearly 50 per cent of the state’s population. In 2013, the difference in the vote shares of the BJP and the Congress was more than 8 per cent. “The party is suffering internally in terms of poll planning, because of the conflict between Shah and Chouhan’s teams,” Said a BJP insider. The Modi wave had helped the BJP win 44.88 per cent vote share in the 2013 assembly elections. But, with Modi’s charm on the wane—as evident from the lukewarm response to his rallies—the party tried to restrict the campaign to local issues this time. Voters are not happy with the way demonetisation and the Goods and Services Tax were implemented. The controversy over the Rafale deal and the Vyapam scam did not help the BJP’s cause either. Will the Bahujan Samaj Party’s decision to go it alone in the polls affect the Congress? “The BSP has been losing its base over the years, especially after the emergence of young dalit leaders like Devashish Jarariya and Chandrashekhar Ravan,” said Dixit. Also, 21 Ambedkarite organisations decided that they would vote to defeat the ruling party. The BJP is banking on its high-decibel ad campaign to counter anti-incumbency. It also leveraged its impressive grassroots reach to connect with beneficiaries of welfare schemes and ensure maximum turnout of its supporters on polling day. “If we win the booth, we will win the state,” Amit Shah told party workers in his first election meeting in Bhopal. The BJP’s national leadership had initially wanted to control the campaign like it had done in Uttar Pradesh, Gujarat and Karnataka elections. But it made the state unit unhappy, forcing Shah to give Chouhan the upper hand in selecting candidates. But, when many of the party’s legislators and candidates began facing angry voters during campaigning, the national leadership once again took control. On November 23, Chouhan was summoned to the RSS headquarters in Bhopal and was handed a list of 60 constituencies where the BJP was facing defeat. The party leadership went into a huddle to chalk out strategies to bring about a turnaround. Chouhan himself ramped up his campaign by addressing more than a dozen rallies a day and writing directly to beneficiaries of government schemes.